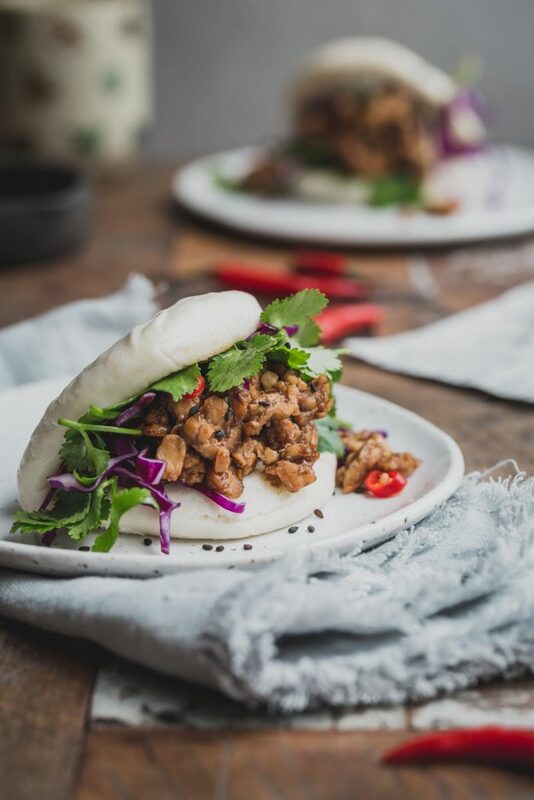 These Vegan Bao Burgers with Peking Tempeh are loaded with gorgeous Asian flavours, packed with protein and just plain delicious. It’s the final week of Vegan Burger Month here at Goodness HQ and I am finishing with a yum cha/burger hybrid. And we are home. After 4 weeks of warm weather, West Coast exploring and more mind-blowing vegan meals than I can list, we stepped off the plane here to blustering winds and near freezing temperatures. LA traffic is looking pretty good right now! On the flip side, we also came home to Walter and Scout. After a month without canine cuddles I was more than ready to get home to our four-legged babies even though Walter did eat our couch, our mattress…and his own bed. That dog is a dufus but I still love his face off. Eaten furniture aside, I’ve come home feeling inspired. The cookbook is now with the publisher and I finally feel like I can let go of it and see where the adventure takes me. It’s a new feeling for me, letting go. I generally hold on to things like a squirrel with a nut but it’s dawned on me that life doesn’t wait. It marches on and you can either march with it or get left behind. I don’t want to get left behind. Let’s move forward and upward. So, what are vegan bao burgers? A bao burger is simply a burger with a bao bun..er…bun. If you’ve been here before, you might recall the Goodness family loves yum cha so it seems only fitting to end Vegan Burger Month with a yum cha/burger hybrid. Bao buns, traditionally filled and enclosed, make a delicious and novel burger bun. While you can make the buns yourself, most Asian grocers stock plain bao buns with a handy split already in place ready for your favourite burger filling. Bao buns are light and fluffy creating the perfect base for my Asian-inspired vegan bao burgers with peking tempeh. Cooking with tempeh is relatively new to me. My gorgeous and talented friend Gena from The Full Helping has inspired me to explore recipes with tempeh, an ingredient I always had an aversion to. To be honest, the stuff always looked funky to me. However, after trying some of Gena’s inspired tempeh recipes, I am a devotee. Besides being loaded with protein, tempeh lends itself to so many awesome flavours making it perfect for these vegan bao burgers. Thanks, Gena. 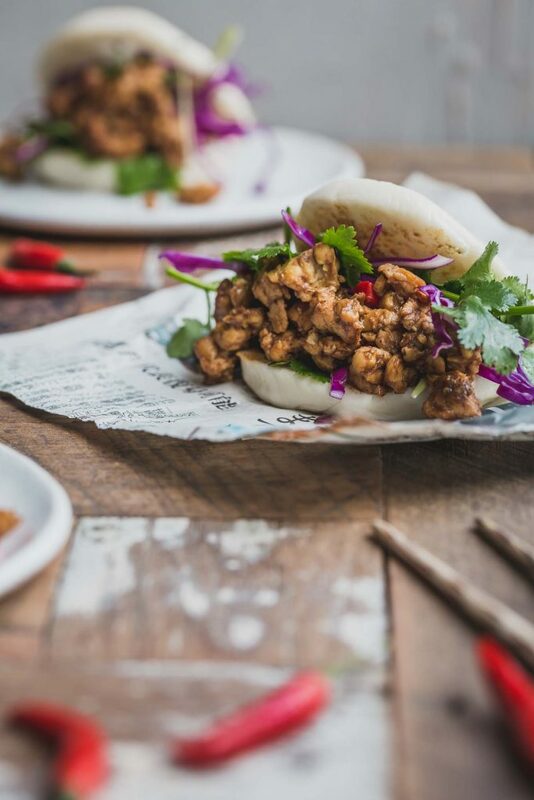 With sweet hoisin and maple, five spice and salty tamari, these vegan bao burgers with Peking tempeh are a celebration of contrasting flavours and textures. 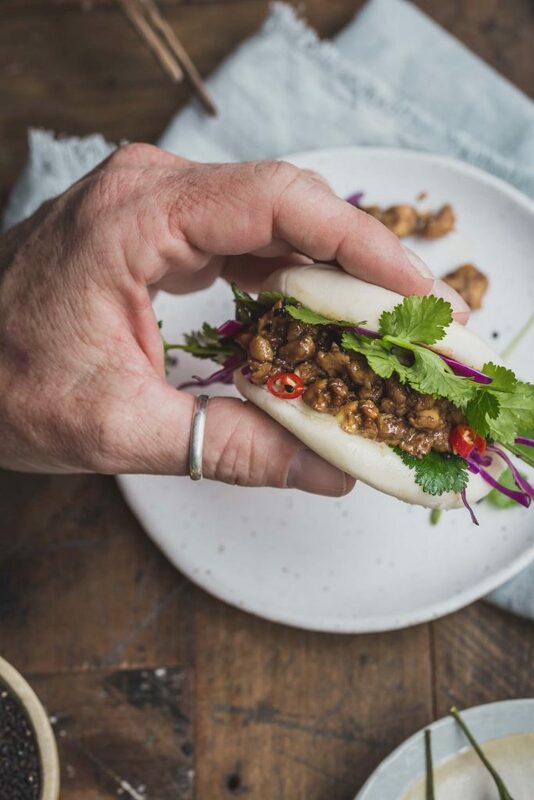 Soft pillowy bao buns provide the perfect balance to the robust Peking tempeh and fresh, crunchy herb salad. So, as we bid adieu to vegan burger month, I am looking forward (an upward) to sharing some of the wonderful dishes I discovered on our recent travels. Like all things interesting and good, the dishes we tried are a mish-mash of different cultures and styles. I think the best things happen when old things come together to create something new. 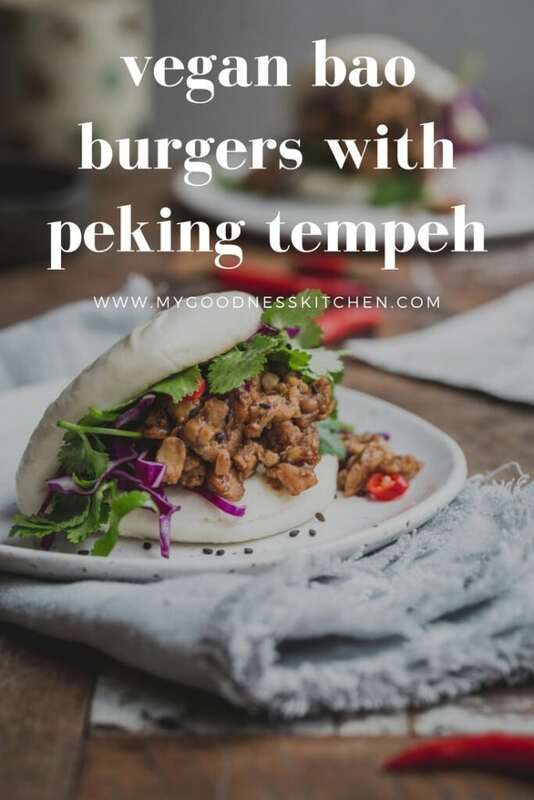 Combining two of my food loves, yum cha and burgers, this Vegan Bao Burger is filled with gorgeous Asian flavours and the goodness of protein-rich tempeh. To make the tempeh, break the tempeh block in to small chunks (1/4 cm pieces) and set aside. Combine the tamari, maple, hoisin sauce, Chinese five spice, freshly finely- grated ginger and sesame oil in a bowl and stir to combine. Stir in the tempeh and set aside. To prepare the bao buns, fill a saucepan (sized to fit your steamer) with 1-2 inches of water. Bring the water to a simmer and place a steamer basket on top of the saucepan. Place the bao buns in the steamer and steam, with the lid on, for around 7 minutes or until the buns are soft and fluffy. While the buns are steaming, heat the peanut oil in a medium skillet or pan over medium heat. Add the tempeh and marinade and cook, stirring frequently, for 5 - 6 minutes or until the tempeh is cooked through. Remove from the heat. Combine the coriander, cabbage, chilli and sliced scallions in a small bowl and toss with a few drops of sesame oil. To assemble the vegan bao burgers, remove the steamed buns from the steamer basket and carefully slice in half keeping the bun intact. Add a good amount of the coriander/cabbage salad, followed by the peking tempeh. Serve with additional chopped chilli (optional) and additional hoisin sauce. I had no idea you could find bao buns at Asian markets. That’s such a good tip! I really like bao, but I’m not into bread-making. Hey Cadry. I was so stoked to find them but I am not sure they are available in all markets. You could google your local area. I hear you though, I don’t always want to make them from scratch. I just want them in my belly. Have a great day! You’re privacy is important to us. You can find our policy here.